Gertie's New Blog for Better Sewing: McCall's 6503 and a Cat Bed for Henry! McCall's 6503 and a Cat Bed for Henry! I made a dress and a cat bed! I'm really more excited about the cat bed, can we talk about that first? I finally made it up last weekend, thinking that little Henry Higgins needed a place to hang out in my sewing room. I was very proud of it, and then a little disappointed when he ignored it. But lo and behold! This morning I walked into the room and what did I see? I'm so pleased he likes it! He spent all morning there. I made it in a simple blue ticking stripe. Very masculine, don't you think? I loved the pattern itself. Simple, slightly 40s inspired, and super cute in the ruffle version. 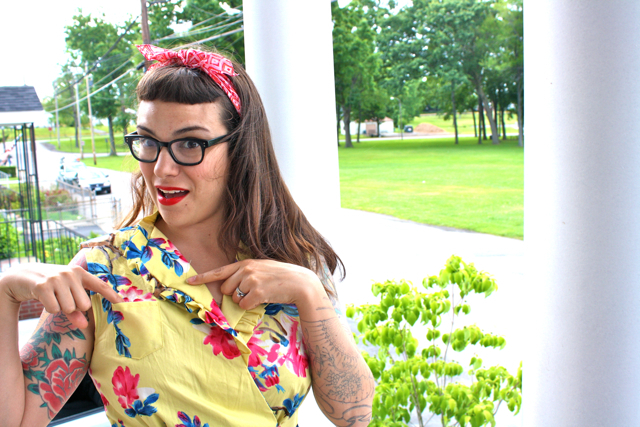 It's one of those easy breezy summer dresses that you find yourself reaching for all the time. I wore it out to dinner last night. I added my own little design feature: a tiny pocket! 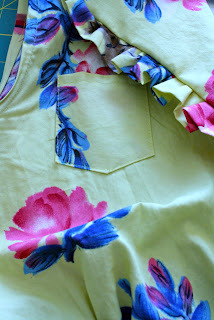 The easiest way to make a pocket like this is to cut out a template--without seam allowances--from a sturdy paper. I used an old manilla folder. Cut the fabric out with the template, leaving about 1/4" on the sides and bottom, and 5/8" on top. Press the seam allowances over the template, so they're turned in crisply. Topstitch the hem at the top of the pocket. Apply to your dress by edgestitching. That's it! This dress has no linings, just a neckline facing and bindings around the armholes. I went old-school and pinked my seam allowances. Love the dress (and the cat bed!). I bought some of this fabric in a different colorway from Fabric Mart (I think it's something like $8/yd there now). I had a terrible customer service experience at Paron's yesterday, unfortunately I don't think I'll be going back. It's too bad, because they really do have beautiful fabric. 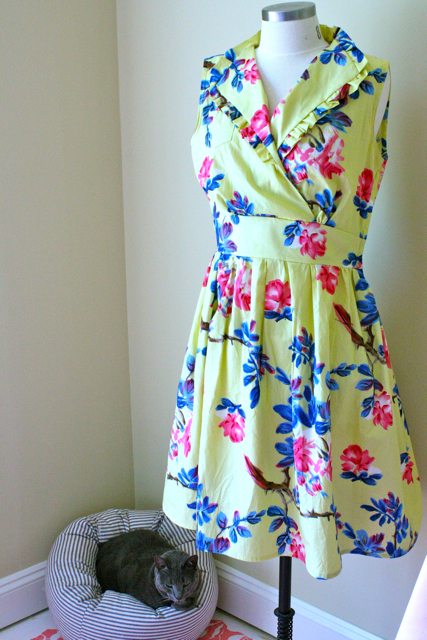 Lovely dress (love those Ascher prints) and what a cute cat bed! Glad to hear there are restaurants in the new nabe! Love the Ascher prints. I think you start selling them in your Etsy store. That is fantastic! I love the pocket. Beautiful dress! I wish I had an occasion to wear a dress! 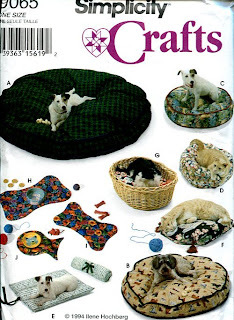 Just love your things, also love your Craftsy classes. Your kitty looks very content in his bed. Hi, really cute dress. 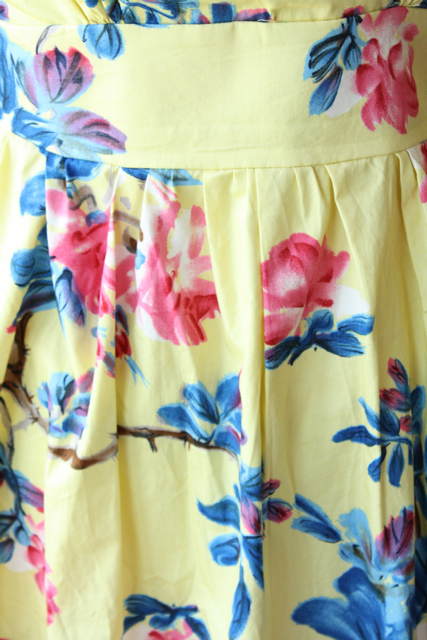 I really like the pattern too, I used it to make a dress for a Tea Dance. There's just one thing missing from the cat bed. One little thing. Not major for you, perhaps, but MAJOR for the feline. Add a heating pad and you will have a CAT FRIEND for life. That's all. Henry is so cuuuute in his new bed! The fabric of the dress is so nice, I wish I could go there and get some. I seriously need to make a larger version of the cat bed for my newly adopted beagle, who at 18 pounds probably doesn't weight all that much more than most cats, lol. Melodye, condolences on the loss of your poochie. ((hugs)) We lost our 13-year-old beagle to lymphoma in December. We knew we'd want another beagle, after an appropriate mourning period. Brownie can't be replaced, but rescuing another homeless dog seemed like a good way to honor her memory. And sweet little Willow has helped heal the heartache. That is a beautiful dress, I love the fabric! Such a sweet dress! I love it! Aah, I have that dress pattern. 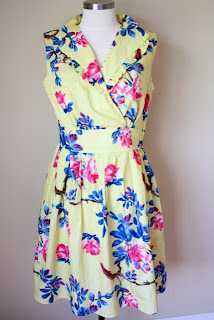 It's confidence-inspiring seeing more people sew it, there were very few blogs of it when I first bought it (even despite being featured on The Sew Weekly) I'm looking forward to getting the chance to make it up now! I made this dress a few weeks ago too! Love the style and the 40's kind of fit. But I think the cat bed is 'da bomb." I never would have considered that pattern based on the envelope (and I'm usually pretty good at looking past the photos to the line drawings). 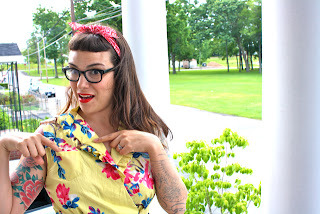 Your dress is beautiful; it looks great on you and I love that fabric! I love the idea of a cat bed but to be honest... I kind of like it when my cat lounges across my sewing machine :) I pretend that it annoys me but that's a lieeee! If I made her a bed, she'd leave my machine alone & then I'd feel so lonely haha. I love the dress. The print and colors goes very well with your tattoos! Thanks for the tip on the pockets. I remember reading it somewhere but had forgotten until now. I am in the middle of making this very view! It's a lovely summer dress. I am using the facings, but also lining the bodice with cotton batiste just because my cotton is rather light, and lining the skirt with rayon Bemberg from my stash. Your print is beautiful - and your cat looks very happy! I love how genuinely cozy animals look in pet-bed ads. I mean, duh--that's the point, but it really cracks me up. And it never takes pets long to find the most comfortable spot in the room, does it? We had a problem with our white, long-haired, dog sleeping in my mother's brand-new, dark-green, plush chairs . . . until we got her her own sheepskin dog bed. It was just like the chairs only she didn't have to climb into it. We never had to shoo her off the furniture again. What a fantastic dress! 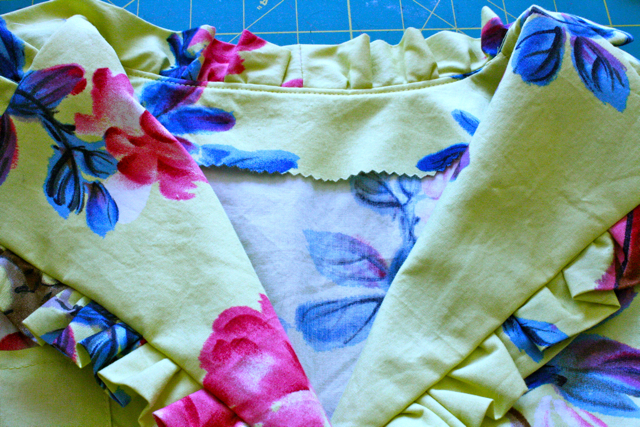 I love the little ruffles around the collar. I've been wanting to make a bed or beds for my dog and two cats, but I'm afraid they'll be uninterested after I spend hours on them. Plus three pet beds would take up half my sewing space! Love it! Great fabric too! I have that pattern - I may just have to dig it out and take a second look at it this weekend. I love the fabric and your kitty cat looks so happy with his new bed. I love the way it turned out! The pattern of the fabric is lovely. I actually considered buying that dress pattern at the fabric store today, too! 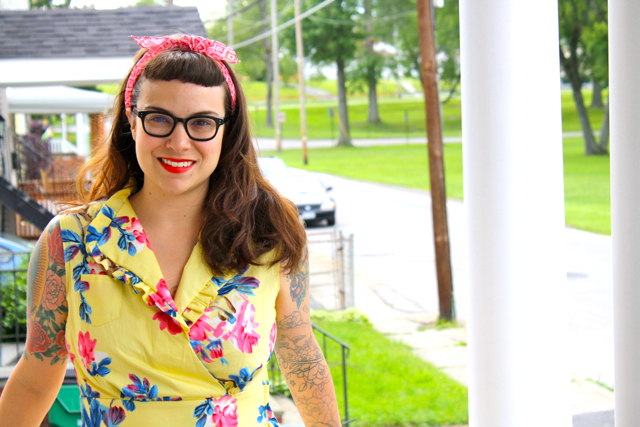 I just started my sewing blog, check it out if your interested! Love your style! Can't wait til your book comes out. The dress is lovely! I love that fabric. And His Handsome-ness, Henry, looks wonderful in that gorgeous bed. Love me a ticking stripe! But you've got me wanting to make another in a floral-cute! That pocket is very clever! What did you use for the stuffing in the cat bed? Ack, Ascher fabrics!? WHERE!?! (alas, as a Midwesterner, I've never been to Paron's...) It looks lovely! And so does the dress! 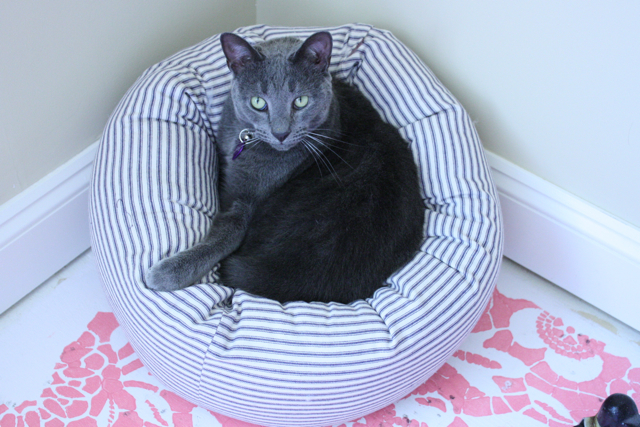 I love the cat bed, too--love ticking stripe; it makes everything look classy. He looks so cute in his little bed ! Ive never made a bed for the cats for fear they'd never use it. Such a lovely dress! If I tried to make that bed for my dog I'd have to scale it up an impossible amount... fat old golden retriever!! Gorgeous dress! Love the style and the fabric! The dress is beautiful and Henry looks so cozy!! The kitty looks so handsome in his new cat bed...leave it to a cat to decide when HE wants to get in it! The dress is lovely..I like the pinked edges, I gotta get myself a pair of pinking shears! I love this dress! And the print! Thanks for posting, it's quite inspiring! Love the cat bed, I made one for my dog and she did the same thing, I was so relieved when she decided it was ok and started to use it. The dress is lovely, I bet you were the best dressed at the restaurant. I also wanted to mention that my Hobby Lobby has Simplicity patters for 99 cents next week. I had not been in years, but I recently discovered a new Hobby Lobby built last year. It may be the new location but it seems like they've improved their sewing and fabric section. And you can't beat 99 cents. Lovely cheerful colour and so glad the cat likes his bed so endearing ! You know, it would be interesting to hear your views on photography, regarding cameras. I loved your articles on Bernina, your dream driermachine, or your iron.. what about the pictures? they are gorgeous! and as the little blogger that I am, well... some learning in that area would be super! I'm so excited about that cat bed, but Quincy likes to "sleep around" (the floozy). She just likes to switch up her sleeping spots all the time, so even if she tried it out for a couple of nights, she'd be somewhere else within the week and I'd be sad. Henry looks so cuper cute on that one though, so maybe I'll give it a go anyway? Love the cat bed!!! Love the dress even more!!! Especially the print! I have a cat named Henry also, an orange tabby. He has a brother named Gunnar and together we refer to them as the Orange Menaces or the Orange Brothers. I'm inspired to make kitty beds, thanks. 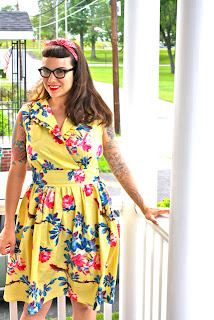 Cute dress--I've forwarded your blog to my sister, who adores retro and vintage and is the most amazing seamstress. 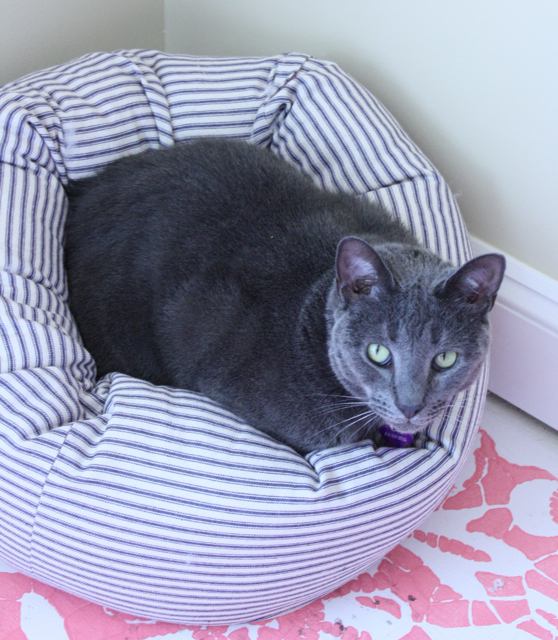 The cat bed is fantastic and epitomizes some of what I adore about sewing--making a custom gift to share your love! p.s., found your blog via SewingPatterns.com on FB! Oh, that's a great cat bed! We MacGyvered one for our cat out of a semicircle wood basket (placed on the flat side), which we then lined top and bottom with cheap fleece blankets, cable-tied to the top. More blankets draped over the top and covering some of the front make it a super-cosy bed in the winter (our house is not warm) - but it took him months to deign to use it! He's handsome and your dress is adorable. I can't decide which one of you two is cuter! I just discovered your blog on a search for couture techniques while making my wedding dress. I went back and read every entry and wanted to thank you for your enthusiasm and fun writing. 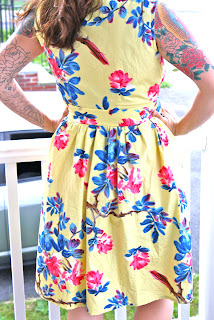 It has really inspired me to take my sewing a little (a lot) farther than I have before. I am looking forward to keeping up with the blog on a regular basis (now that I am caught up). That cat bed is great, and I love your cat's full name! Super cute! Your dress is great too. You go with the pinking shears!! What a cute cat! And he has such a fluffy looking bed! I love that dress! The print reminds me one of the muumuus my grandmother brought back from Hawaii when she went there in the late 70s. The yellow one was for my aunt! Mine was pink, purple, and green! Wow! Great blog! Love your style, your tattoos, you just look gorgeous! You just keep going, girl, what you do is fantastic! greetings from Vienna - I tell you, it´s so freaking HOT here!